Following on from the huge success of the MRX 300, MRX 500 and MRX 700 AV Receivers, Anthem have now released 3 new high-end AV Receivers that firmly make them the best AV receivers on the market today. With an A/V receiver, everything you need to drive a music and home theater system is contained in one component. They are a space-saving, cost-effective alternative to separates (i.e. a preamplifier, A/V processor and separate external power amplifier). 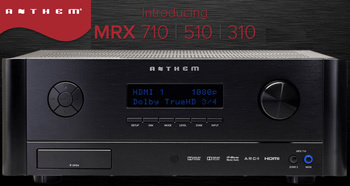 Anthem MRX receivers continue to win awards for their sound quality and ease of integration, and best of all, include ARC™—the Anthem Room Correction system. 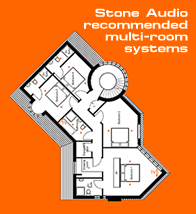 An award-winning lineup of state-of-the-art audio/video performers with an exceptional performance to value relationship and equipped with ARC 1M Anthem Room Correction. The MRX 710 7 channels: 120 watts per channel. The MRX 510 7 channels: 100 watts per channel. The MRX 310 5 channels: 80 watts per channel. 7 rear and one front-panel HDMI input. Advanced Load Monitoring keeps an eye on output. Robust IP and RS-232 control. Remote control apps for iOS (Apple) and Android.